If you’re thinking about buying a drone The Best Drones for All Budgets The Best Drones for All Budgets What are the best drones? We covered quadcopters for the poor, rich, and everyone in-between. Whether you want a flying selfie machine or cheap cutting-edge toy, we've got you covered. Read More , particularly one aimed at aerial photography Latest Drone Photography You Have To See To Believe Latest Drone Photography You Have To See To Believe Drone photography is an exciting new technology that allows anyone to take awesome aerial videos. This article runs down some of the best on the internet. 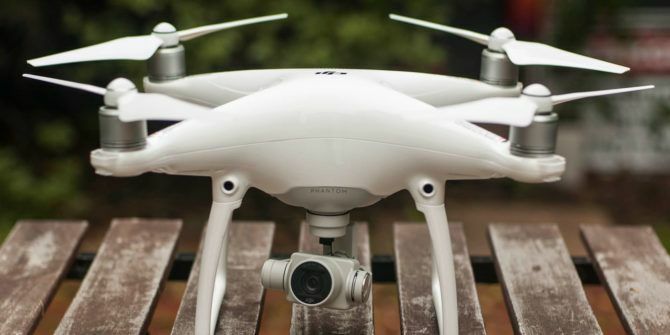 Read More , DJI’s Phantom 4 will probably be on your radar. It’s the first DJI drone to introduce smart features like obstacle avoidance and return-to-home, but it’s not cheap, at just over $1000 for the basic kit. Let’s take a look at whether the Phantom 4 is worth the price of entry, whether it’s right for you, and the drawbacks you should keep in mind if you’re setting foot inside drone territory for the first time. Can’t afford one? That’s ok – we’re giving our test model away to one lucky winner! The first thing I noticed about the Phantom 4 is the massive, oversized carry case it comes in. It’s made of a tough polystyrene type of material, it resembles a coolbox, and its quite big in comparison to the size of the drone. Inside the box you’ll find the drone itself, a remote control, a battery, a charger and some cables, two sets of rotors and some DJI literature for getting started. To fly the drone you’ll need to bring your own smartphone or tablet, and a USB cable to connect it to the remote unit. The drone itself is made of a sturdy white plastic which straddles the line between tough and lightweight. The propellors, gimbal and parts of the battery are metal but otherwise DJI have opted to keep the unit as light as possible. In fact the drone is incredibly lightweight until you fit the battery. This takes the form of an “intelligent” battery — presumably because it tells you how much charge is left when you press the button. Each Phantom 4 battery carries a charge of 5350 mAh which feeds the drone at 15.2V. They’re also pretty pricey, at $169 per cell if you want to buy spares. The remote control is made of the same white plastic, with comfortable rubber grips and sharp control sticks that stick to your thumbs like glue. There’s a mount on the front for your smartphone or tablet which can accomodate small iPhone 5-sized devices all the way up to a 9.7″ iPad (no room for a larger iPad Pro iPad Pro, Smart Keyboard & Apple Pencil Review iPad Pro, Smart Keyboard & Apple Pencil Review The iPad Pro isn't just a larger and faster tablet — it represents an entirely new way of using iOS. The real question is: does it work, and more importantly — do you really need one? Read More though). In addition to dual analogue flight controllers, you get two customizable “trigger” buttons, three shoulder buttons, a dial for controlling the camera tilt, a return to home button, and a power button. Just like the regular battery, you can tap the power button once to see how much charge your remote control currently has. It’s all very comfortable to hold and use, even with a big iPad mounted in the middle. The rotors must be removed to store the drone in the box, and though it takes a minute or so, putting everything together is very simple. The battery slides into the slot in the center of the drone, the propellers are color-coded, the remote mount is quickly adjustable, and there’s no reliance on Wi-Fi or Bluetooth as the remote uses a USB connection to talk to your device. Once everything is charged (including your smartphone or tablet, of course) you’ll need to download the DJI GO app from the iTunes App Store or Google Play. Then, when the drone has been activated via the Internet, the app will guide you through the setup process and you’ll be learning to fly The Best of Internet: Learn How to Pilot a Drone with These Handy Websites The Best of Internet: Learn How to Pilot a Drone with These Handy Websites Drones are popular and it doesn't look like they're going away anytime soon. But they're surprisingly hard to pilot! Here's where to go when you're first learning to fly. Read More within a matter of minutes. You’ll need to manually configure the compass within the drone by picking it up and turning it around in various directions. You’ll also need to leave the drone to its own devices for around 5 minutes to configure the IMU before your first flight. When you see “Ready to fly” then you can hold the left and right control sticks down at the 4 o’clock and 8 o’clock positions respectively to take off. The Phantom 4 makes excellent use of a beginner mode to stop you from trashing it before you know exactly what you’re doing. It’ll hold your hand for much of the process, and provide some quick tips about flying and landing the drone as you get acquainted. You won’t be able to take off in beginner mode unless you have enough GPS satellites available to return you to home if things go wrong. Other limitations include speed, altitude and distance. With beginner mode off, the drone becomes a lot more sensitive, much faster, and provides free reign to go as high and as far as you can. At this stage you’ll be relying on the feed from the drone’s camera to fly, particularly if you lose line-of-sight with the quadcopter. The Phantom 4 includes a few notable improvements over past Phantom models, including the ability to automatically avoid obstacles. This should stop you from flying into walls, trees, rock faces, and whatever else you come across. Smart Return is another bold feature — promising to return the drone to wherever it took off from should it lose connection or run out of battery. There are two other new and exciting features: ActiveTrack allows you to track moving targets automatically, TapFly lets you tap somewhere and fly there. These features demonstrate where DJI is taking such technology, arguably in a more user-friendly direction, while still allowing full manual control via the remote. The Phantom 4 is essentially a flying camera, and it will likely appeal the most to aviators with a keen interest in aerial photography. You can take up to 4K video What's the Difference Between 4K and Ultra HD? What's the Difference Between 4K and Ultra HD? Thinking of buying a new TV or monitor but feeling lost with all of the terminology like 4K and Ultra HD? Here's everything you need to know about it. Read More , with multiple ultra-HD settings, an option for 2.7K and even 120fps at 1080p. It also snaps 12 megapixel still images. Under the right conditions, you’ll get a range of 5 kilometers (about 3.1 miles) from the Phantom 4 at an altitude of 120 metres. This assumes little in the way of interference, and you’ll need to make sure the antenna on your remote are facing the drone. Battery life is rated for 28 minutes, and I’ve found that to be accurate — with shorter flights using less battery than I expected. Flying the Phantom 4 is, as expected, tons of fun. It’s also easier than ever thanks to the new features DJI has added. Return to home and obstacle avoidance are excellent safeguards to have, particularly when starting out, learning to fly, and managing your power. It could be argued that DJI has made drones more accessible than ever before 5 Amazing Uses for Drones in the Future 5 Amazing Uses for Drones in the Future Unmanned aerial vehicles, more commonly called drones, are now infamous for their surveillance capabilities, but like most tools, the usefulness of a drone depends on who's in control. Read More , but accessibility still remains one of my biggest concerns (which I’ll get to shortly). The controls default to a scheme known as “mode 2” — the left stick controls altitude and which way the drone points, the right stick controls speed and direction, in addition to being able to “strafe” left and right. It’s just like using a game controller, especially when paired with a first person viewpoint of what the drone is seeing. Lag between the video feed and input is minimal, and arguably doesn’t impact the Phantom 4 in the slightest when used for the sweeping aerial shots DJI does so well. The remote control is intuitive and customizable, both the main control scheme and the customizable buttons on the back. It’s not overwhelming and all the other features you need are compartmentalised within the DJI GO app. The drone itself is pretty loud when sitting on the ground in front of you. It sounds not dissimilar to an electric lawnmower, and it’ll kick up leaves and loose dirt when you take off. It’s not a subtle machine, it’ll likely scare off wildlife, and your neighbours will definitely hear it. After the initial setup, how quickly you affix the rotors will dictate how quickly you can get airborne. You can even take off without a GPS lock if you’re not using beginner mode. 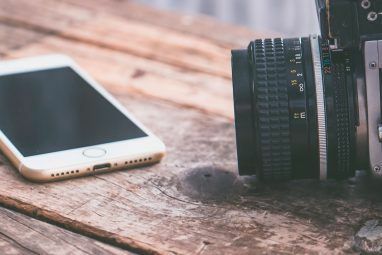 Video and stills are saved directly to a microSD card The Fastest and Best microSD Cards The Fastest and Best microSD Cards We've rounded up the fastest and best microSD cards for use with security cameras, DSLRs, smartphones, tablets, and more! They range in price from the ultra affordable to the premium. Read More , and the Phantom 4 I reviewed came complete with a 16GB card which is good for around 30 minutes of 1080p video at 60 frames per second. Even though 28 minutes flight on a single charge isn’t a long time, it’s a marked improvement over so many of the cheaper hobby drones available. Until we see significant battery improvements, motor and other hardware efficiency will be key to improved flight times. At $1,000 a pop, the first few flights with the Phantom 4 are a bit daunting, especially when it comes to going almost out of sight and to high altitudes. That’s where the additional safety features come in, as well as beginner mode for those who don’t quite trust themselves. If the idea of flying a quadcopter from a first person viewpoint excites you, you’re curious what your house looks like from above, or you want to get into aerial video and photography then the Phantom 4 will bring a smile to your face. While the Phantom 4 is an accomplished bit of kit that’s fun to fly and packed with smart features, there are three things you should consider before spending $1,000 (likely more) on such a sophisticated bit of kit. The first is how restrictive your local area is for flying drones Why Air Traffic Control Will Be Necessary for Future Drone Use Why Air Traffic Control Will Be Necessary for Future Drone Use By 2018, up to 7,500 drones will be occupying US airspace. How can we stay save as these robots vie for control of our skies? Some engineers believe air traffic control is the answer. Read More . Assuming you live in a city, you may have trouble legally flying the drone, unless you’re prepared to travel to do so. Here in Melbourne (Australia), I can’t fly if I’m too close to a helipad, airport, military base or other controlled airspaces. This has definitely hindered by enjoyment of the drone, as I’m unable to lawfully fly it in my back yard. There are further restrictions on being a minimum distance away from other people, not flying over busy streets or beaches, and maintaining line of sight with the drone. You can get a license to lift some of these restrictions, but they’re pricey and might not be worth it to the hobbyist. You might not have this problem, especially if you live in the country. In this case you’re at a major advantage, and won’t face a hefty fine if you get caught. The second problem is the size of the carry case, particularly if you don’t intend to transport your drone by car. The drone itself isn’t huge, but the carry case is massive. The case doesn’t fit into any bag I own, including a huge camping backpack. This means that carrying it around is a real chore — especially if you’re hiking or cycling. DJI produce a backpack you can buy for a further $200 if you want to carry the drone with you on your back, which is more than the cost of a spare battery. I tried everything I could think of to get the drone around by bike, even covering the drone in bubblewrap and putting it “naked” into a large backpack. Eventually I resorted to buying a bike rack and strapping it on using bungee cords. This is arguably the main reason both DJI and GoPro are targeting portability with their latest products. The Phantom 4 isn’t great for those without cars, especially when you consider you’ll need to carry your iPad, some spare batteries, food, water and any other supplies you might need. The final drawback is cost. The drone is on the expensive end of the spectrum — not quite as much as some of the more “professional” heavyweight quadcopters, but substantially pricier than cheaper hobby drones. The previous two points stand here too — you may be limited in your usage depending on where you live, and you may have to buy a pricey extra backpack or bike rack just to transport it around. It’s not a cheap hobby, and you could well end up spending $2000 on your DJI habit once you take spare batteries, chargers, and transport into account. Don’t make the mistake of thinking you can just buy the drone and that’ll be good enough. The Phantom is all about getting out and about, exploring new places from new perspectives. At the very least you’ll want a few $169 batteries to get a few hours flight out of each trip. The DJI Phantom 4 is a beast. It’s fun to fly, loaded with smart tech that provides ample peace of mind, and it captures stunning video that’s worthy of professional productions. It can fly home if you venture too far, land safely if you run out of batteries, and even guide you through the process of becoming a competent pilot. 28 minutes on a single battery is pretty good, but you’ll be left wanting more than that once you really get into it. A Phantom 4 hobby can be very expensive, potentially limiting, and too big and cumbersome to make the most of without a car or further expense. There’s a good reason the latest drones focus on portability above all else, so keep that in mind when planning a purchase or opt for a smaller model instead. Explore more about: Drone Technology, MakeUseOf Giveaway, Photography. Ok, so I guess the giveaway is ended, where are the winners announced? OMG I have been eyeballing this beauty for a while but couldn't bring myself to purchase! It would be AWESOME to win! Wow, this drone is really amazing! Wish I had money to buy it... Thank you very much for this bombastic giveaway! I hope I win it! Would love to win so that I can take take awesome pictures and videos during the summer! DJI Phantom 4 is THE best drone on the market. I have done a comparison and DJI Phantom 4 is miles ahead of all the competitors. Here seems like build quality is good that i can see here. Camera feature awesome for recording as well as photoshoot purpose and the setting up tab on remote is very good feature provide..
As i have seen this drone seems like a prfect drone and i thing its camera good for recordind as well as photoshoot and build quality seem good. Also it can be used for varous working time. Love the awesome detail that you put in the review. Of the DJI Phantom 4, the latest in drone new. taking a love of photography to whole new crazy heights. The site usafreebiesdaily bought me here. It's an worldwide giveaway so i guess i can win this too. I never seen anyone in my area have one of this. So i'd love to win this awesome drone. I really want to win this. Am sure i am going to feel like king of the world if people see me with this. I am from India. Excellent Review scoping the Good, the Bad and the Ugly. I work in Local Government IT and Disaster Management in a Queensland rural area and can see a myriad of useful applications for a drone with these capabilities at a realistic price point. very instructive review, but you write quite a lot about the large size of the transportation box . A photo to show this beside a person would tell more than many words. These are great! A friend of mine has a Phantom 3, and it's incredible. The footage he records with it is simply breathtaking! Great article, with break down of the different considerations aspects. What a great toy to have!! :) May I? This article was most helpful in directing me as to shelling out >$1,000 for an aircraft I may not be able to fly in my area… causing me to drive a long distance just to fly the drone. The features on this DJI Phantom 4 are awesome. Very thorough review...As a restoration / preservation architect, his would be a great way to document historic buildings. I would love to have one...maybe I'll win this one. Great drone and great review. Can the "Active Track" feature follow me if I go for a ride in my bike? Does it avoid any obstacle in its path? I just found your website with this article featured on Google. Great and extensive article with light and dark sides pointed. I love the phantom 4drone. Great review and site! I'm new to MUO having just discovered it. I'd love to enter to win! Unfortunately I just had my P4 along with my laptop, DSLR, 2 lenses (one of them an L glass lens), and even my important docs folder with things like my birth certificate and SSN card stolen when my car was broken into. They even smashed 2 windows inû the car (if I win l can provide the case number to prove all of it) so I am crossing my fingers!! Great review and very detailed. Thank you for the opportunity to win the drone. Great review, you guys have an awesome site and I've learned tons about a lot of topics, especially home automation. I love flying my friend's X5sw but it has a cheaper feel to it and doesn't have nearly as many feature. Also the lower video quality hardly makes it worth putting the camera on at all since it eats about a third of your battery that's already rated for a low 5 minute flight time. I'd love the chance to try out the Phantom and send you guys some cool footage! DJI P4 is a great in between model of the Mavic and the Inspire1. Although the Inspire2 has a better low light camera than the Mavic, the mavic holds it's own very well. um yeah how do i enter? Cool! I've been considering getting a drone for a while, the Phantom 4 looks like a good choice. Would love to add this to my arsenal ? Followed on FB and Twitter! Another fantastic quad copter is the Autel Robotics X-STAR Premium. 7 day a week, USA based support who you can call on the phone and get help. The problem with DJI is the horrible history not providing support. Autel Robotics for the win! Been saving money for a while to get a drone. Was waiting to see what would happen with the Mavic and the GoPro drone. Then DJI released the P4 pro, looks like the one. I'm a photographer and several friends said they would like to see what I can acxomplish with a drone. I'll have to wait a little longer since $1500 is a little more than I expected to pay. Thanks for the review. Do I reply to enter?How do I enter? I don't see where to enter the giveaway. This has got to be one of the coolest giveaways! I would love to have this. I would imagine this would need to be registered in the US. Excellently written article. Very informative and unbiased, being the best I've read in my long deliberative search for the best drone for me.